The Safedem team has wide experience in dealing with all types of decontamination projects for many clients. Safedem provide Decontamination Solutions beginning with assessments and evaluations, investigations, feasibility studies, and proposals, through to final reporting and certification of cleanliness. 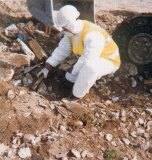 The contamination may be pharmaceutical, chemical, hydrocarbon, or radioactive and may exist in a variety of forms i.e. liquid, solid, gas, vapour or powder. This contamination can be present on surfaces or in the air. Safedem is capable of carrying out decontamination works to meet all Health and Safety Regulations.